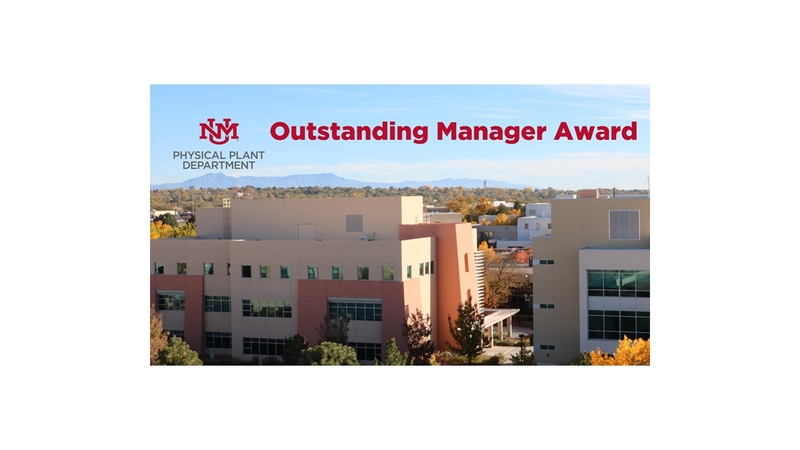 Nominations are now being accepted for the Physical Plant Department (PPD) annual Outstanding Manager Award. This award was developed to appreciate and recognize the qualities of excellence, leadership, and customer service in the departmental managers. Nominations will be accepted until March 31. Anyone at The University of New Mexico can nominate a PPD manager for this award. Nomination forms can be found on the home page of the PPD website. To be eligible for this recognition and award, a manager must provide excellent customer service, be an asset to their unit, have made a significant contribution to the success of their work group, and/or have promoted a positive work environment for their staff. The winner will be announced in April, and their name will be added to the permanent plaque resides in the Service Building. They will also receive a smaller plaque to keep in recognition of their outstanding leadership at PPD. Last year’s recipient was Michael Crocker, manager of the HSC Custodial Services.